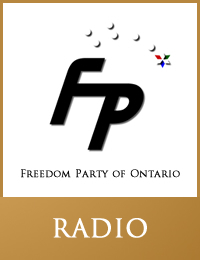 At 7:30 AM, on The All New Morning Show (1290 AM CJBK, London, Ontario), Robert Metz, president, Freedom Party of Ontario, was interviewed about the provincial auditor’s report; the role of government; the importance of the price system in the electricity system; the government’s fire-sale of Hydro One; the need to introduce competition, from the private sector, in health care and insurance; the costliness of nuclear power; the need for the government to quit fighting climate change; socialism; the pointlessness of a carbon tax; the constancy of climate change and Man’s inability to control it; and the carbon-based attempt to redistribute wealth around the world. 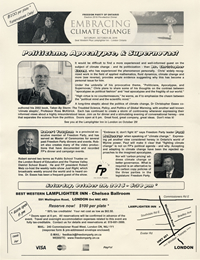 These recordings include the lead-up to the interview, and a brief post-interview discussion about the interview, with CJBK host Andy Oudman. 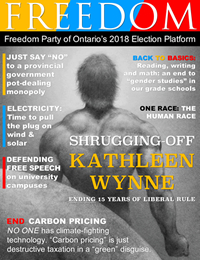 “Ontario will discard the Liberal/Progressive Conservative climate-fighting agenda if a Freedom government iselected in the June 2018 provincial general election….” Click here to read the full media release. “Freedom Party of Ontario is pleased to announce that Wayne Simmons has been nominated its candidate in the coming by-election in the riding of Scarborough-Rouge River…” Click here to read the full media release.